Lovely 2 Bedroom Duplex Apartment in exclusive Cabo Roig. Our lovely 2 bedroom duplex apartment is laid out over 2 floors, where the lounge opens out onto a terrace especially good for alfresco dining. The lounge/dining area has TV with satellite channels, including most of the main UK terrestrial channels, movie channels & Eurosport. Wifi internet is available on request. There is also a DVD player. There is a seperate well equipped kitchen with oven, ceramic hob, kettle, microwave, fridge freezer and washing machine, and just about everything else you would need for a great family holiday. There are 2 bedrooms, both with air-conditioning. 1 double bedroom with private balcony, and 1 twin bedroom. There are 2 toilets, 1 toliet and shower room downstairs, and a full bathroom and toilet upstairs. There is a single foldaway bed available for use in the lounge, so the apartment sleeps 5 comfortably. A cot and highchair are also available on request. Bed linen and towels are provided but please bring your own beach/pool towels. Sun lounges are supplied for use on the terrace and by the pool area. The community lies at the end of a no through road and has a private gated entrance. There is a private gated car parking available. The apartment is part of the Los Anguis V community, which is well established within Cabo Roig. It has well maintained beautiful gardens and pathways and 2 communal pools with showers. 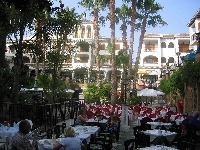 The community provides a tranquil respite, yet is close to both shops and restaurants as well as the two Cabo Roig beaches. WE ALSO HAVE AN ALMOST IDENTICLE APARTMENT ON THE SAME COMPLEX WHICH IS AVAILABLE AND IDEAL FOR LARGER GROUPS. PLEASE ASK FOR DETAILS. Situated among broad avenues, lined with swaying palms and landscaped gardens. Some forty-five minutes drive south of Alicante airport, lies the delightful peninsular of Cabo Roig. Cabo Roig rates as one of the most exclusive developments along the Costa Blanca situated five miles from Torrevieja and five minutes drive from the Villamartin golf course. The Maritime Walk, which embraces the whole of the peninsular coastline, gives access to some of the finest sandy beaches on the Costa Blanca. The area is blessed with a uniquely dry climate with a remarkably low rainfall and over 340 days of glorious sunshine each year. According to the World Health Organisation Torrevieja and its surrounding areas are �almost as perfect an environment as it is possible to obtain�. This area is also rated to have the healthiest climate in Europe and second in the World. The salt water lakes absorb water from the atmosphere to create a special microclimate which is widely regarded to be beneficial for sufferers of rheumatism, asthma, bronchitis and other respiratory problems. There are mud baths and various health treatments also available locally. The resort's sandy beaches are among the most popular of the entire Spanish coast. They consistently win the European Blue Flag for cleanliness and a full range of watersports are on offer including windsurfing, sailing, snorkelling, water skiing, fishing and scuba diving. Just north of Cabo Roig small cliffs enclose and protect a continuous series of quiet coves and small sandy beaches. Should you want to relax in complete isolation, or get naked! try the miles of golden sand, backed by the pine clad dunes of Guardamar or the unspoilt paradise of Calblanque, a gorgeous natural park near the Mar Menor, 13km of coves, sandy beaches and fossilized dunes, all backed by a pine forest of hills and an excellent network of walking trails. The Murcia area is becoming very popular with golfers as there are 17 superb golf courses within 30 minutes drive and several more under construction. The Nicklaus Trail provides various types of course from desert to parkland and other courses such as La Peraleja constructed by Seve Ballesteros has some excellent par 3�s. Three courses are within 10 minutes of Cabo Roig. Campoamor is situated in two valleys with magnificent views and a beautiful clubhouse, Villamartin has an abundance of olive trees and well placed bunkers to make it a challenging course for players of all abilities and Las Ramblas is stunning but a short course and is challenging with high trees, natural fairways and ravines feature strongly. La Finca is 15 minutes drive where a new clubhouse is being built to serve the Spanish Open and La Marquesa is close by. Roda golf is highly recommended, is 15 minutes away and very popular with it�s signature 7th island green par 3 surrounded by water a must for golfers of all standards. La Manga is 30 minutes away and has 3 championship courses to play. (Pre-booking your tee-off times is advisable - at some courses a handicap certificate is required, discounted fees can be arranged). Golf clubs and buggies can be hired.